There are numerous travel-related applications for machine-to-machine (M2M) technologies within the Internet of Things (IoT) domain. Many of these apps include enhancements to automobiles. ABI Research forecasts shipment of new cars featuring Autonomous Parking technologies will grow at 35 percent compound annual growth rate (CAGR) between 2016 and 2026, and for revenues to growth at a 29.5 percent CAGR. 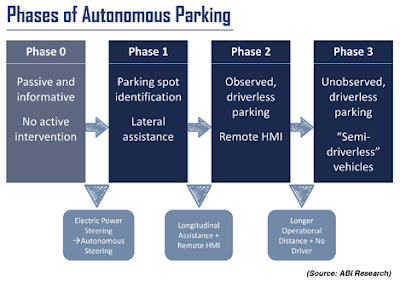 ABI Research identifies three phases of autonomous parking, with each successive stage set to gradually displace the former and all three coexisting to some degree over the next decade. Ultimately, technology will reach a point in which the car parks itself entirely, with no driver assistance or presence within the car required. In Phase 1, the car will provide steering assistance with the driver still inside the vehicle and in control. Phase 2 shows autonomous parking with the driver outside the vehicle but still in control, and Phase 3 introduces autonomous valet parking in which the driver leaves the vehicle at the entrance of a car park. The car then parks itself and waits for the driver to summon it when it's time to leave. "Passive assistance from ultrasonic sensors and exterior cameras are becoming standard features in most new car models in developed regions," said James Hodgson, research analyst at ABI Research. ABI believes that as more car manufacturers adopt autonomous parking solutions, consumer education on the system safety benefits and added convenience the technology offers will convince them of the value. Research indicates that car owners clearly need more information about these benefits. The American Automobile Association (AAA) published survey results that suggest 80 percent of American drivers believe their own parking abilities to be adequate. Only 25 percent of respondents would trust a self-parking system to replace them in the parking maneuver. "The market could see a spike in consumer adoption of autonomous parking technology if drivers are drawn by correlated lower insurance costs," continues Hodgson. Phase 2 technologies are evident in the January 2016 launch of the Tesla OTA Summon auto park feature, as well as the BMW recent launch of Remote Control Parking on flagship 7 Series in certain regions. ABI analysts say that while current Phase 2 technologies are limited in ability, as current car systems can only move the car forward and backward at a distance of a few meters and cannot turn the car, it is an important step forward in that it successfully parks the car with the driver removed. As the market moves toward the new future of driverless vehicles, parking will remain an important function, but the evolution could bring about big change. Car parks will theoretically not need to be close to the driver's final destination once cars can park themselves without driver observation or control. This could signify larger social advantages for crowded areas, as inner cities may soon be able to reclaim parking spaces for other purposes. At the same time, the need for parking spaces may ultimately disappear altogether, as shared driverless vehicles drop-off and pick-up customers in a near continuous way.